Okay, I was trying to hold off posting a NEW CHAPTER, but I'm tired of waiting to post until the whole story is finished. Enjoy! Our Story So Far: Sin is defeated, its occupant freed... but being Sin for thirteen years is not something one can throw off in a day. A day in St. Bevelle began with the ringing of many bells from the city heights — yet too few, with gaps of silence when the Tower of Light should have boomed forth. A chilly marine fog seeped between panes and under doors. Auron and Lulu rose and dressed in silence, exchanging ironic looks as the mage bundled herself into the bulky robes of a novice nun. As the last peals died away, they slipped out, threading corridors where tardy acolytes scampered towards chapel. Those few who made eye contact were too tongue-tied by the sight of the famous guardian and his severe companion to offer more than a reverent bow. None noticed that Yevon's prayer was not returned. Outside, the gardens were cold, foggy and uninviting. A glimmer to the east showed where the sun would burn through. Dew lay heavy on leaf and stone. Above, invisible gulls wheeled and keened. Lulu halted at the edge of the grass and breathed in. Earth, flowers, herbs, and the homely scents of cooking from the refectory blended with the smell of the sea. Auron waited. Abruptly she bent and removed her slippers, pressing her toes into the wet earth. Loose hair flying behind her, she strode swiftly out onto the close-cropped lawn, wetting the hem of her gown, walking the concentric circles between beds of flowers and herbs. Auron followed more slowly, marching towards the fountain as she wandered aimlessly here and there, touching plants as she passed. A mental image came to Auron as he watched: her dream-bower, an infinite cage, more verdant yet utterly barren for all its fruits and flowers, a cloister of trials with no terminus for a failed guardian to pace for years without end. At last she reached him, turning away from the fountain and gazing back at their footprints marching in parallel across the dew-silvered grass. "Well, that hasn't changed, at least," Lulu said. "No." Auron was watching her feet, not the ground. She had stumbled while crossing the lawn. Unimportant, perhaps, but she had always been so sure-footed on their travels, inexplicably elsewhere whenever a foe's claw, fist or wing-tip swept towards her. "What?" she said, noticing his scrutiny. He shrugged, diverting her attention back to the garden with a nod. "Hardly up to your standards." "It's real, you mean?" Her fingers fluttered towards the stumps of a freshly-pruned rosebush. "But I think I know how it feels." The motion turned into an upswept gesture that he should have recognized sooner. "Catch." He had only begun to move when the ice-spur nicked his ear. Rumbling, he stepped forward and caught her wrist, nodding down at the small white flowers underfoot. They moved to the empty lawn before the fountain, amusing themselves with old drills. She cast. He parried. Auron had to take care on his follow-through, checking swings that nearly clouted her. Suspicions confirmed: her judgment of close distances was a little suspect, or else she was having to relearn the boundaries of her own body. To judge by her prim frown, she knew it. She would not stop dueling even when a stray chunk of ice struck Yuna's statue and deflected the fountain's spray, drenching both of them. Auron's whirling blade moved faster as her footwork became more confident. Melting ice crunched underfoot, and the ground around the fountain was growing muddy. Now and then a monk or nun, cutting through the cloister on errands, gave them an agitated look and a wide berth. At last the abbot himself emerged and made a beeline towards them. Auron touched Lulu's arm and straightened, planting his sword. "Father Zuke." Lulu's hands made an abortive gesture, and she settled for folding her arms. "Good morning," Zuke said, bowing. "I trust you both rested well? I missed you at morning prayers." "Very well, Father," said Lulu, averting her gaze from Auron's too-complacent expression. "Excellent. Is there anything you need?" Lulu passed a look towards Auron. "No, we are content." "Anything you wish, then?" Zuke said. Auron had the impression that the old priest was fishing for something, for all that his manner was unpressing. "I'd like to take up your offer of healing lessons, when you have the time." He pursed his lips, considering. "My time is never my own, my dear, therefore, my time is yours. You are, after all, my second-best student." "Second-best?" she said over Auron's hmph. "Isaaru learned all that I know. You had your own notions of what mattered." Zuke's eyes twinkled. "So. Shall we remove to my office, to avoid interruptions? Sir Auron, would you like to observe?" Auron shook his head. "Don't overdo it," he told Lulu. As she stepped onto the paved colonnade surrounding the cloister, Lulu's feet nearly went out from under her on the slick flagstones. The priest looked down. His brows jerked upwards at the sight of her toes and heels plastered with mud and bits of grass. "I'm surprised to be telling you, of all people, to wipe your feet." The mage laughed, an unrepentant sound that rippled across the cloisters. She dashed away the dirt with a water spell and followed him inside. Auron took up his sword again and smiled. Lessons were served over Zuke's excellent herbal tea. Lulu warmed her hands with the clay cup, listening with eyes, ears and shoulders. Absently, she stirred the steaming liquid with a fingertip capped in ice, taking small sips. Zuke faced her earnestly across the desk, gnarled hands steepled on a nest of papers. "Curing magic is most like watera, the inviting, the offering, the opening of channels to old rains that air and soil remember. A white mage cannot force flesh to heal, bone to knit. You must rouse it, remind it of its proper form and shape. You must gather the energies of pyrefly-essence and with them— Lulu?" Her scowl was a thunderstorm, fierce, bitter. "Pyreflies," she said. "That I can do." "Can you, now." He paused to shuffle scrolls and parchment, clearing away the space between them. She drained her cup slowly, ignoring the dangling interrogative. Zuke shook his head slightly and continued. "But life-energies are stronger than pyreflies, which can only reflect, sustain and magnify. And yet life is weaker— or rather, more delicate— than the elemental forces that you command. For you tap time: you summon all the lightning strikes, all the rains, every frost, every wildfire whose memory is stored in the air and soil around you. Whereas life–"
"It is ephemeral," she interrupted, "But surely, the power of life is everywhere too, for most matter in Spira has been part of living flesh at some time." "Yes. I think that may go a long way to explaining how pyreflies build the bodies of fiends. But each life is unique, and you can't graft one to another." "No." She set the cup down with a sharp clank, sloshing out the last few drops. "No, we can't." Again, the crease-lines of care around his eyes deepened. He paused to refill her cup, setting it aside with his to cool. "So," he said, "we must use pyreflies to cradle and concentrate one life's frail pulse, as one shields and blows gently to nurture a spark into a blaze. White magic requires a gentle touch, supporting rather than directing. Do you understand?" "I think so." She refocused on him with a hint of warmth. "I've watched you and Yuna do it often enough." "Hem, yes." He looked pained but pleased. "Well, then. Let's try a simple exercise." Propping his elbows, he raised his hands, palms facing her. "Now, I'd like you to close your eyes and try to bring your hands as close to mine as you can without touching. The first step to healing magic is body-awareness, not of your own flesh, but of another's." "Like fayth and aeon," she murmured, leaning forward to mirror him. He gave her a keen look. "How so?" Again, the mage said nothing, closing her eyes and flexing her long fingers like a musician sizing up a strange instrument. Then she stilled. Zuke waited, nodding mute encouragement as she sought for unseen currents. A minute passed. Finally she began to edge towards him, reaching, swaying slowly from side to side as she probed, stalking with spread fingertips. The old man kept silent, watching her painstaking progress with a nonjudgmental eye. At length, she halted with their hands a span's breadth apart. Her eyes opened. The mage puffed her cheeks in disdain, eyeing the gap. Zuke smiled and raised a finger, motioning for her to return to her starting point. She nodded and tried again. After a dozen attempts, she finished with their mirrored hands almost touching, barely offset. One of her fingers twitched, catching his skin with a nail. She cursed. "No, that's good," he said, dropping his hands to his sides and shaking them out. "That's enough. Impressive, for one more attuned to non-living forces." He reached for his cup. "Now I think we should heed Sir Auron's counsel and call this a promising start." "A start," Lulu said, frowning. "Forgive me, Father, but I am in some haste. I realize that learning happens slowly, but—"
"Lulu." The loving respect in his tone nearly disarmed his words' sting. "You cannot be trying to outflank another summoner." "No." Her face clouded. "Or rather— no. She is young. She does not yet know what she yearns for. No, Sir Auron and I have another errand. There are relics left in Zanarkand which should not be left for curious adventurers to find. It's best that we... deal with them. Soon." "I see." Sorrow, questions and protests furrowed the fan-lines around his eyes, but he banished them with another easygoing smile. "I could loan you a healer, you know. Doddering summoners aside, there are many capable youngsters who would consider it an honor." "And none I would risk." "In that, you have not changed, my friend." He pondered, then stood and moved to a cabinet, drawing out a blue swirling sphere on a squat metal stand. "Very well. Let's proceed to a training sphere. It is easier to demonstrate on a real wound, or rather, on its simulacrum." Returning to his chair, he placed the artifact on the table between them and settled his hands around the sphere's lower half. "As I recall, you were always more relaxed when you need not fear casualties from a stray bolt." His brow furrowed. "Although relaxed is not quite the word. More focused, rather." She placed her fingers across the top. "I just didn't like anyone to see my failures, as well you know." His eyes crinkled at her candor. "You have mellowed." The cramped, dim office dissolved around them. The rug was replaced by an infinite plane of hard-packed gray earth, scored with a faint grid. Walls vanished, yielding to an infinite horizon. What passed for sky was a mottled, diffuse haze the color of ash. Zuke arrived first and stood waiting. Lulu tumbled into view with less than her usual poise, pyreflies eddying up from her feet like dust-motes. He took a half-step towards her. "Lulu?" Her form remained insubstantial, revealing the horizon through the shadow of her body. Her pale shoulders and face formed a white triangle, defined by a low neckline and the slant of dark hair that fell across one eye. The shapeless white robes of Bevelle had been replaced by an elegant black gown, once tailored, now tattered. The belts that comprised its skirt flowed out in a sweeping train that blurred into vines and creepers. The ground itself had changed in her vicinity, resolving into sand, rocks, and splintered bones. Pyreflies danced around her like drunken stars. Seeing his face knitted in dismay, she looked down, flung her arms up as if to ward off the pyreflies, and blinked out. Zuke backed out of the dream-space almost as hastily, jostling the sphere off its base. The reassuring normality of his bare priest's cell rematerialized around them. He made a grab to keep the sphere from rolling off, then raised his eyes to find Lulu seated across from him. The white novitiate's gown was unchanged, and her fingers were clenched around the edge of the desk with reassuring solidity. Zuke sagged in his chair, struggling to hold his voice level. "Steady, Lulu. Ground and center." "It's all right." She straightened, breast rising and falling in repressed heaves for some seconds before she mastered herself and folded her hands in her lap. "I'm sorry, Father. I didn't realize I was so rusty. Let's try that again." "Again?" He stared. "I think not, my stubborn friend." Her mouth turned down. "I said I'm fine. I just need to focus." "No, Lulu. This experiment has gone far enough." He gathered up the sphere and set it on the window-ledge behind him, ignoring her swelling indignation. "I must commend your determination. But you are not yet recovered, and even if you were, this was a rash thing to try. I have no business taking an untethered fayth into the training realm." Her eyes flashed. There was a long, crackling silence before her chin dipped in grudging acknowledgment. "You know?" "Not at all; I'm quite agog with ignorance." He gave a mirthless huff of laughter. "But I fear I can guess what, or rather, whom, Isaaru meant yesterday, when he declared that 'Sin's unwilling fayth' has been freed." Zuke flapped a hand abruptly. "Drink your tea." Mechanically, she reached for the earthen cup and began to take it in small sips. "I'm not... untethered," Lulu said finally. "It... I..." She gestured at herself, a slashing motion that dismissed what it indicated. "There's no statue to house the fayth of the Final Summoning, Father. Just flesh and bone. Mine. Sir Jecht's. Lady Lilith's. And all the other guardians who accompanied their summoners to the very end." "The fayth of the Final Summoning?" he said, and stopped. Horror dawned slowly in his old eyes. "A guardian's soul? Dear Yevon, you mean to say that—"
Lulu exploded out of her chair, slamming her hands against the table. "Yevon made... me... Sin!" Her cup burst before it hit the floor. Zuke recoiled. The room felt suddenly hot and dry. The mage's form seem to flicker again, or perhaps a bird had just flown past the window, cutting through the sunlight. High, sharp cries seem to come from a great distance, gulls or human voices distorted by the thickening air. Lulu's hair lifted from her shoulders as if from static electricity. Steeling himself, the priest reached across the desk, laying his papery hands across hers. Her fingers were too warm, her nails uncomfortably so. "Lulu. Daughter." His voice broke on that one word. "Whatever happened, you are not Sin now." The oppressive heat bled away slowly. Her head drooped. She gave a mute squeeze of acknowledgement before drawing away and turning her back. "I'm not so sure of that." "I am," he said. "Ill-tempered as ever, and you've come back with enough firepower to melt Gagazet, I'll be bound, but that's Lulu all over." "Thanks a lot." She let out a chuckle that was half a whimper. "No, really. Thank you." "The least I can do," he said. He bowed his head, resting his furrowed brow against his fingertips. "I should have looked for you, when you did not return." "No," she said. "You couldn't have reached me. No one could." "Except Sir Auron, apparently." He paused. "Ah. Yes, of course. I begin to see." "Auron." She spoke the name as a talisman. "Spira will never know what he endured to make us free." "I suppose not." He cleared his throat. "What would you have of me, Lulu? This wish to become a healer. Are you seeking atonement?" "To what? In whose name?" She turned back, arms folded. "My victims are dead. I'm damned. Nothing can alter that. But Sir Auron and I must return to the Hall of the Final Summoning and end this, lest another follow in my footsteps. There is little in Zanarkand which can threaten us, but I must be prepared for that little. And—" Her expression softened. "As I told you, Father, I am tired of being only a destroyer." "There are different routes to redemption." He exhaled. "For what it's worth, Lulu, I believe that you two have the strength you need." "Flesh bleeds, whatever the will that binds it. And I must insist that you let me try that sphere again. I can't afford to be tripped up by a few pyreflies; Zanarkand is swarming with them." "Oh." He considered. "Let's reconvene tomorrow. I'd like to consult with Isaaru, if you don't mind." The door opened. Auron stepped in, closed it, and looked between them expectantly. "A useful lesson," Lulu said. "Thank you, Father." Zuke, still unsettled, lost a beat before replying, "Glad to help, my friend." "Hmph," Auron said, but did not pry. "Yuna's asking for you." "Lady Yuna?" Zuke said, even more bewildered. The mage relaxed. She realized suddenly that the muffled high squeaks she had taken for birds outside Zuke's stained glass window were children's voices, and that the sunlight had grown strong enough to cast shadows. "Wakka's child. Come, Father. I'd like you to meet her." Awash in sunshine as new as the Calm, the cloister was rather more crowded than they had left it. Younger clerics, attending to weeding and pruning, greeted the abbot with imploring, scandalized glances in the direction of the fountain. Wakka and Rikku's children were frolicking there, the youngest two sans clothing. Shrieks of delight and a blitzball's tinny thump echoed loudly through the cloister's arched galleries. Lulu gave a quiet sigh of sheer contentment. Auron glanced down at her and relaxed. Whatever had happened in Zuke's office, the color had returned to her cheeks. "Careful, Father," Lulu said to Zuke as they strolled towards the fountain. "I sense fiends in the undergrowth." The ex-summoner gave her a wry look. "Very small ones, I assume." Giggles erupted from the nearest bushes. As they drew parallel, Yuna burst out and flew across the mulched path, arms outstretched. Lulu stooped and caught her hands. "Sorry, sweetling. You're too big for me to carry, as I am now." Without breaking stride, Auron swept out an arm and scooped both of them onto the nearest bench, depositing the girl in Lulu's lap. Lulu, giving him a reproachful look, attempted to smooth her skirts beneath the wriggling child. "Not quite the honor due the lady, sir guardian," Zuke said, expression bland. "I'm sure she'll whip him into shape," Rikku said, untangling herself from Vidina, who had imitated his sister and tackled the nearest target. "Took me about six months with Wakka, so I guess Auron'll take...oh, I donno, six years?" Wakka, snatching the blitzball out of the air and tucking it under his arm with a sheepish expression, shuffled over and cleared his throat. "Father Zuke?" "Sir Wakka." Zuke bowed warmly. "Welcome back. I'm glad to see the years have treated you well." "Uh," Wakka said. "You too. Thanks for putting us up." "Lady Rikku I have met; who are these lovely children?" "I'm Yuna," said the girl, squirming around to stare at him unabashedly. "And you're bald just like Pop-pops!" "That would be Elder Cid?" he said, shrewd eyes darting from the girl's strawberry mop to Rikku's blond braids. "And I expect you know this place was named for... your aunt, yes?" "Well, yes and no." He looked quizzically at Wakka's frantic hand-motions. "Retired. Or failed, if you like. I now serve as the abbot of this cloister. Once upon a time, your father and Lady Lulu were my guardians." "Dad was a guardian?" Yuna said, clutching at Lulu's hair. "Like Sir Auron?" Wakka cleared his throat noisily. "And that's Etta and Mbela, and this here's Vidina." "Hi," said the boy, tone guarded. His attention was fixed upon Zuke's priestly vestments, the Yevon runes picked out in black embroidery on starched white fabric. The other children took no notice, tittering as their mother shepherded them out of the pool. Zuke bowed graciously. "Pleased to meet you." "Yeah. Hey, you. Are you a Yevon, too?" Vidina said, looking pointedly at the woman holding his sister in her lap. "Yunie said so." "No longer," Lulu said with cool satisfaction. "Lapsed, like your father." "'Lapsed'?" Vidina said, still suspicious. "What's that mean? Dad would never—"
"Breakfast!" Rikku said, clapping her hands. "Come on, everybody, towel time! Vidina, Yunie, help your father fetch the trays. Hope you don't mind, Zuke; we raided the cafeteria." "Not at all." The priest bowed again, returning his attention to Lulu and Auron. "I must return to my duties. Tomorrow morning, yes?" Lulu inclined her head fractionally. "I look forward to it." He smiled, but his stride was slow and preoccupied as he retraced his steps back to the halls. "So," Auron said, watching him go. "We'll need to restock your potions," Lulu said, sounding ruffled. Yuna scampered back to them, balancing a tray across her outstretched arms. Soup was pooling in the sodden napkins, but the spicy aroma rising from a covered basket smelled heavenly. "Eat," Yuna said. She bumped against Lulu's knee. "Mum says it's bad for you to miss breakfast." "Thank you, Yuna." Lulu set the tray onto the bench next to her, took a pair of chopsticks, and selected a small bite of rice. "It's good." "See?" Yuna scrambled back onto the bench and picked up a dumpling with her fingers. "No more pyreflies. Wait till you get home. Dad's cooking's the best." "Yes." Lulu's hesitation was so slight that even the girl did not notice. "Yes, that was one thing he always did well." "I heard that, Lu!" Wakka called, tossing the ball over from where he was sitting on the lawn. It bounced lightly off Lulu's shins. "We won't tell her about your cooking, ya?" The mage kicked it back in his general direction. Water splattered everywhere when he leapt up to intercept it, although the ball had been quite dry when it left her foot. The children shrieked with laughter. "Hey!" Rikku said. "No blitzballs at meals, remember?" Glancing over at Lulu, she bounced to her feet abruptly. "Oh! Speaking of cooking... you didn't use any sun goo, Lulu, did you? Good thing I've still got some. You're looking a little pink from yesterday." She ambled over, digging into the pouch at her hip. Auron was beginning to suspect that she had somehow connected it to the Farplane to hold all her alchemical components. "Here we are!" She brandished a small stoppered pot and waggled it in front of the mage's nose. "One ice queen ointment, coming up! Want me to put some on or—" she lowered her voice, smirking at Auron— "should he do it?" "I doubt you or Sir Auron need sun protection," said Lulu. "But I'll have some, thank you." Auron averted his gaze while Rikku applied the ointment to Lulu's exposed skin. It was an old ritual, familiar from their long-ago pilgrimage. The women fell to mundane chatter, discussing how to "liberate" Lulu from stuffy robes which, Rikku declared, made Lulu resemble an albino flan. Absently chewing on a squashed dumpling that the child pressed into his hand, Auron drifted away from their banter. Retreating to the cloister's back wall, he observed the pleasant scene with detachment: a family picnicking on the lawn, acolytes bent to garden tasks, two women plotting a shopping expedition into the city. This, truly, was the Calm they had fought for, the ordinary life which seemed to him more foreign than Sin's dreamscapes. Auron marveled at how easily the mage could step back into Spira's currents. Then again, after Braska's pilgrimage, he had faced changes almost as disorienting. With all truths, all hopes, his own life extinguished, he had fallen straightaway into the utterly alien world of Tidus and Jecht's dream-Zanarkand. Zanarkand was waiting. Much as he wished for Lulu to savor a few days' peace, the pilgrimage road beckoned. Peace without purpose was still a vague threat to him. He needed a fixed terminus drawing him forward. He would not, could not accept the path of old Maechen, that wandering scholar who had long ago forgotten he was unsent, until he was little more than an absent-minded recording sphere with mouth and legs. And Lulu? What would become of her? As his thoughts circled back to her, Auron's vitals gave a disconcerting sideways lurch. For a moment, a powerful suction was dragging at him like Guadosalam's breach to the Farplane. Colored lights descended before his eyes. The chopsticks Lulu had been holding slipped and fell, spearing the dirt. Rikku chattered on, oblivious, but Yuna was patting the mage's face. Then, like a retreating wave, the nausea subsided. A faint, insistent tug remained, a minor irritant like the background hum of the pyreflies. Lulu was already collecting herself, features smoothing over. She chucked the girl's cheek. Peripherally aware of the child staring at her, Auron refrained from questions. To judge by Lulu's curt head-shake, she was as baffled as he. 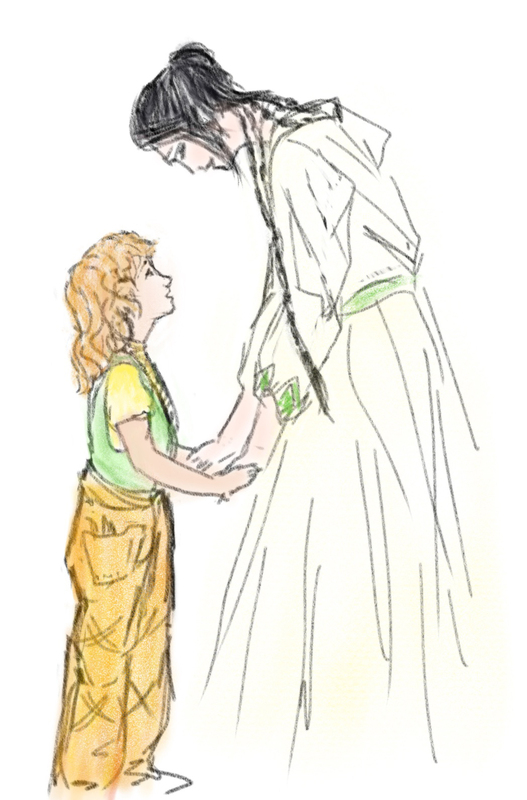 Author's note: I usually assume a mentor-student relationship between Lady Ginnem and Lulu. However, I've noticed that Lulu addresses Zuke in the original Japanese as sensei, which could simply refer to his temple rank, but is also the word for master/teacher. During their brief but telling interaction, Zuke appears to be speaking to her as a trusted friend or protegé. By contrast, he has no special words for his other guardian, Wakka. This entry was originally posted at http://auronlu.dreamwidth.org/209686.html, where it has comments. Well that all makes sense. I'm curious to see what happens to her when they go back to Zanarkand.